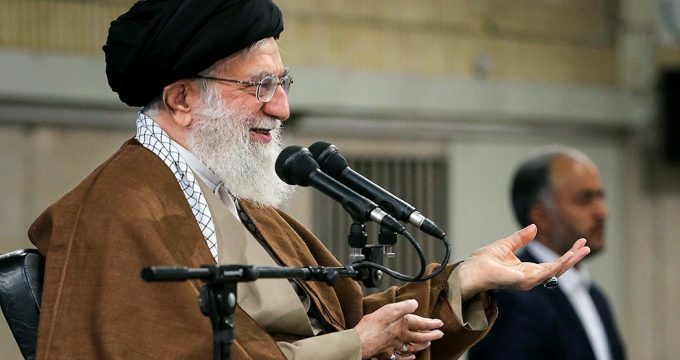 FNA – Supreme Leader of the Islamic Revolution Ayatollah Seyed Ali Khamenei voiced confidence that Iran will triumph in enemies’ propaganda war, warning that they display a distorted and unreal face of the country to the world. “Displaying a wrong, negative and disappointing image of the situation in Iran is the most important agenda of enemies today but thanks God, the real image of the country in general is contrary to the image shown by the arrogant powers,” Ayatollah Khamenei said, addressing the prominent Iranian academics and elites in Tehran on Wednesday. Ayatollah Khamenei said if Iran makes progress in scientific fields, the enemies’ political and economic threats will decrease. He also cautioned that the arrogant powers even use lethal methods, including assassination of the elites, to exclude them from the society. Ayatollah Khamenei voiced pleasure that Iranian universities and academic centers have made good progress in different aerospace, biological, air industry, nuclear industry, stem cells, dam industry and recombinant drugs fields. He also underscored the need for scientific relations with the countries which have taken major strides in scientific arenas, and said most of these states are in Asia and in the Eastern hemisphere of the world. Ayatollah Khamenei, meantime, noted that waiting for assistance from the West and Europe will delay the country’s progress as they do not easily provide others with their achievements. In relevant remarks early this month, Ayatollah Khamenei underlined that the Iranian nation would certainly be able to defeat the US sanctions.